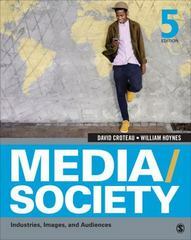 Media/Society 5 Edition Media/Society: Industries, Images, and Audiences, Fifth Edition, by David Croteau and William Hoynes provides a framework for understanding the relationship between media and society and helps readers develop skills for critically evaluating both conventional wisdom and their own assumptions about the social role of the media. Retaining its acclaimed sociological framework, the Fifth Edition covers new studies, includes up-to-date material about today’s rapidly changing media landscape, and significantly expands discussions of the “new media” world, including digitization, the Internet, the spread of mobile media devices, the role of user-generated content, the potential social impact of new media on society, and new media’s effect on traditional media outlets. Updated research, the latest industry data, and current examples from popular media illustrate enduring themes in the sociology of media.